Like many areas of early development, you’ll want to pay very close attention to make sure no complications appear. One of the most important areas to focus on is the mouth, not just because it makes a big difference in your baby’s life, but because of how proactive you can be to keep your infant on track. To make this process easier, your children’s dentist in Hillsboro explains a few steps to consider when managing your baby’s early developments. Most teeth begin to appear six months after birth. While teeth are not typically visible in newborn children, it’s important to pay attention to their mouths in this early stage. The moment baby teeth erupt is the same moment decay can begin forming. By the time they hit age three, all 20 of their teeth should appear. 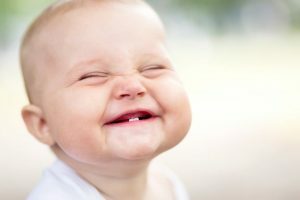 At about six months of age, you can expect to see their four front teeth first. In some cases, they won’t appear until 12 or 14 months. One of the most common oral health issues in infants and toddlers is baby bottle tooth decay. This condition occurs when babies are consistently exposed to drinks in baby bottles containing sugar. When babies are put to bed with a bottle in hand, they’re far more likely to experience decay in this way. Do not share saliva with the baby, either through shared use of feeding spoons or by licking pacifiers. Avoid filling baby bottles with sugar water, juice, or soft drinks. Only use formula, milk, or breast milk. Make sure they finish any drinks in their bottle before bed. Avoid dipping pacifiers in honey or sugar before giving to your child. When cleaning your baby’s teeth before they erupt, use either a clean damp washcloth or gauze pad. This will keep their gums and mouth clean. Once their teeth erupt, use a brush specifically designed for babies and a grain-sized smear of fluoride toothpaste. Brush your child’s teeth twice a day and once they have two teeth that touch, make sure to floss them daily. After feeding them, wait 30 minutes before cleaning as the acids in saliva can cause damage when scrubbed too soon. Discuss teething, pacifier use, etc. Looking for a dentist for kids in Hillsboro that will take your infant’s oral health seriously? Schedule an appointment with your dentist today! Dr. Michael Royse earned his dental degree from the Oregon Health Sciences University School of Dentistry. After serving as a dental officer for the U.S. Navy, he completed his residency in pediatric dentistry. To learn more about his practice, contact him through his website.